This week I started a YouTube series about color. The intent is to help you to find your love and joy of your yarn collection again. I want to help you pair yarn and patterns. So today’s session is for us to get on the same page about color. Some of this you may remember from elementary school art class. But hopefully there are a few revelations. Click here to watch the video. Below is the transcription. Today we are going to start to talk about color. When I’m at fiber festivals I hear people saying all the time, I don’t know what color to choose. Or I find that I pick the same color all the time. Does that sum up your experience too? My hope is that by watching these videos on color, you will begin to have the confidence to choose colors for yourself. And to choose harmonious colors. And to break out of your color rut. But let’s start at having a shared vocabulary. Color is more than a 5 letter word! It embodies hue and value and saturation and tone, shade and tint. There are so many nuances in the word color. And so let’s start at the beginning. First of all here is the color wheel that I really like. I’ll put a link to it in the show notes. Hue is what we are taking about when we say that yarn is blue or purple or red. It has a specific vibration in the light spectrum. And what I know is that there is a big variation in the colors people CAN see. Scientists believe that the Impressionist painters saw color in a much more vibrant way and faithfully painted what they saw. I see this phenomenon a lot when people describe blue. What I see as navy, others see as purple. The geeky explanation is that individuals have different concentrations of the eye cells that detect color. And the hues in that area slide into each other blue, blue violet, violet, red violet. They are much closer in hue than the other side of the color wheel. You probably remember learning about primary colors in elementary school. So I’ll just mention these quickly. Primary colors are red, yellow and blue. They are colors that can not be made from other colors. Secondary colors are made by mixing 2 of the primarys: red and yellow are orange, red and blue are violet and yellow and blue are green. And then there are the tertiary colors. These are my personal favorite. These are made by adding more of one primary to the secondary. So you have colors like red-orange commonly called coral or salmon. You have a blue green which could be teal or aqua. When classifying colors, people use the words Warm colors and Cool colors. The easiest way to remember these are that the warm colors are the colors of the Sun and the cool colors are the colors of the sea. Warm colors tend to be more vibrant. They tend to excite or agitate us more than the cool colors which are those that relax us. It’s my experience that most yarn that people collect are those on the cool side of the colorwheel. Look at your collection and let me know if that is true for you. You can comment on the video below. Saturation and Value are very closely related. Saturation is how much of the color is in the yarn. You can have a light yellow or a vibrant yellow. Both being clear hue but one having more of the color than the other. There are times that you want that vibrant color to jump out of your work and other times you would want to have a more subtle yellow to play off the other colors in your yarn. So that is the foundation of color that we will be using in the next few videos. Before I sign off today, I want to show you a couple of resources that I have used to develop my sense of color. So until next time, Happy Knitting!! I read the Artist’s Way in 1992 when my life took a total shift away from an abusive situation to one where I was the one in control of my life. It’s funny to say that now, because there are so many days when really I don’t feel like I’m in control. But really, I do decide what I am doing on any given day. Some of those days I may feel like not going to work, but I did decide to keep teaching in the public school system while growing Flying Goat Farm. I do decide if I am working or sitting on the couch or working while sitting on the couch. I decide if I will turn off the TV or when I will do the chores. Anyway back to the Artist’s Way. I did morning pages for probably 2 years straight. I did them religiously. And they did help me find myself again. They helped me figure out my feelings and what my next steps were. I really like to write, but sometimes I decide not to write daily. To get back to that practice of writing everyday, I joined 750words.com. Along with daily morning pages, Julia Cameron you must commit to go on an Artist Date once a week. Man, I had such a hard time doing that. What to do? Where to go? I would go to the LA County Art Museum, duh. That’s a no brainer. I went to farmer’s markets. I went to funky shopping districts, like Main Street in Santa Monica, Melrose Ave or Brentwood area in LA. I went to a great bookstore like the Bodhi Tree (where I even went to a book reading by Cameron) or even to the nearby library to just look at magazines. But they felt disjointed and weird. I never really felt filled up by them, something wasn’t quite right. I stopped doing the morning pages after I went back to teaching full time. In the summers I would dabble in the pages, but it wasn’t really lasting or nurturing for me. Now that I am closer to being a full time artist, I want and need to develop a habit of the pages. Writing morning pages helps me to build my daily intention. It is helping me become a better writing just by the shear practice of writing. Back to artist’s dates. I intended our trip to Longwood Gardens to be a fun day away from the farm as part of a staycation since Bill was off from work. As soon as I stepped into the visitor center, I began to feel like this was an artist date. I saw shots for amazing still lives, colors and closeups that could make beautiful photographs. With each view of flowers, the water scapes, and tree houses with their almost art deco look, I was filling up inside. We strolled through the large greenhouse with it’s orchid room and green wall and delightful children’s garden. I took over 100 photos. Oh boy, we ate lunch at 1906 Restaurant. Lunch was artistically and physically filling. An amuse-bouche of yellow tomato gazpacho. Bill had mushroom soup that was creamy and earthy. I had the crispy salmon. Oh the skin was so delicious and the meat itself was succulent and juicy. The salmon was served with a succotash and lime “essence”. This foam tasted of tart refreshing lime and enhanced the vegetables and the salmon. I need to learn how to make that! It would be good on any recipe where lime juice by itself doesn’t give enough of a taste punch. For dessert we chose the sorbet trio: cucumber with mint, elderberry flower with pear and orange water with tangerine. Each was unusual and so, so good. When we left, we were full of new inspiration and new motivation. We will definitely go back to Longwood for seasonal artist dates. Click here for information about the gardens. How do I get alpaca fiber? Alpaca is available as a commercial top for spinning or you can go to your local alpaca farm and buy fleeces. Fleeces are sheared from the animals once a year. They are usually graded at the time of shearing into 3 to 7 grades. The prized fleece is called the “blanket”. This is the fleece that is on the body of the animal. In the best animals, this blanket fleece is even with very little medulated fiber. The seconds and even the thirds come from the neck, legs and bellies of the animal. This fleece has more medulated* fiber and it is also of more variable lengths. This fiber can be harder to spin, but it can be blended with wool to make a lovely, more elastic yarn. Be sure to ask the fiber farmer about their grading practices and know what you are getting. If you are buying at a festival fleece sale, you cannot usually lay out the fleeces to look at it. In that case, put your hand in a different parts of the fleece and feel. You can take a small pinch of the fleece to see what the staple length is. Do this sparingly, no one wants a fleece that is all torn apart. There is an etiquette to this at a fiber show. You can ask the fleece show volunteers to help you determine a good fleece if you are new to alpaca fleece buying. Handspun Alpaca–one ply is solid blue and the other is hand dyed blues and golds. This really makes the golds pop! How do you clean and prepare an alpaca fleece? Alpaca does not have any lanolin or grease in their fleeces. But the animals do like to give themselves dust baths. So there is dirt and dust in the fleeces, generally. You can wash the fiber before or after you make it into yarn. I would test a small amount of the fleece to find out the level of dirt. If it is very dirty, then wash it before you spin it. If it isn’t very dirty, then you can spin it first and then wash the yarn. Care must be taken to wash the fleece carefully so that you don’t felt or just knot up the fleece. Fill a basin with moderately hot water (180 degrees) with some mild detergent like Orvis paste or Synthropol. Leave undisturbed for about 45 minutes to an hour in a place that will keep the fiber relatively warm. Gently lift the fleece out of the water and dispose of the dirty water. Refill the basin with warm water for a rinse. Leave again for 30-45 minutes. Lift out. Look at the water, is it dirty? Feel the fleece does it feel soapy? If yes to one or both of these questions, then repeat the rinsing step until the fleece is clean and does not feel soapy. Depending on the amount of the fleece you are washing, you can spin out the water in a washing machine or a salad spinner. Leave to dry. When it is dry you can prepare the fleece for spinning. For Huacaya you can card the fiber into rolags or batts and then spin. For suri, you may need to flick the locks to open the fibers. Then you can card the fiber or you can comb the fiber to prepare it. Raw Cria Fleece–you can see the dusty line in the middle of the staple. This can be spun without washing first. How do you design a yarn to take advantage of the best characteristics of alpaca while minimizing it’s foibles? As I wrote in a previous post here, alpaca fiber is very warm and insulating. This is because of the way that it is formed in the folicles. The medulla or inner portion of the fiber has small air sacs. Judith Mackenzie in her book, The Intentional Spinner, says these are a little like bubble wrap. The sacs hold in the warmth of the wearer. This hollowness contributes to its tendency to static electricity and clinginess of the fiber. Alpaca itself is also more slippery than wool is, so you will need to adjust your tension on you wheel to achieve a good twist and take-up. When spinning the fiber, you need to add more twist than when using wool to make the same yarn. But you also need to take care that the yarn is not overspun and therefore stiff and dense. Yarn made from Huacaya will bloom when you wash it and it will give you a halo effect. Most of the alpaca top or roving that you will find commercially are made from Huacaya, since it is more prevalent than Suri. Suri fiber has no crimp and no elasticity. It does have great sheen though and you can find fleeces from local alpaca farms to use for yarn. Suri is much more difficult to spin according to Deb Robson in her book The Fleece and Fiber Sourcebook. Yarn spun from Suri may look even and balanced while you are spinning it. However when it hits water, any imperfections will become evident. This is because it tends to resist being adequately spun. When this yarn is knit or woven you will see the imperfections and you may see some curling. You will need to practice with this fiber to get the results that you want in your final fabric. Flying Goat Farm Superfine Alpaca top is made in Peru from 100% Huacaya. It has a micron range of 24-26 microns . I hand dye the top to make colors that will inspire and thrill you. You can see some of them here. Natural cinnamon brown alpaca fleece plied with a hand dyed brown and purple roving. *Medulated fibers are ones that are a little more coarse. They tend to not take dye well and can feel prickly. Remember I said it was really warm. When you consider making a garment with alpaca, consider the warmth requirements of the wearer. Don’t make a sweater for someone with hot flashes, just sayin’. But that same lovely person, may have cold feet, perhaps a nice pair of alpaca socks would be a better choice. Alpaca yarn, when knitted, produces a drapey, dense, relaxed fabric. This is amazing with the right garment, but this characteristic can be challenging as well. Drapey and relaxed fabric can also stretch out of shape and a dense fabric can be too warm or too heavy. What kind of stitches work with 100% alpaca yarn? 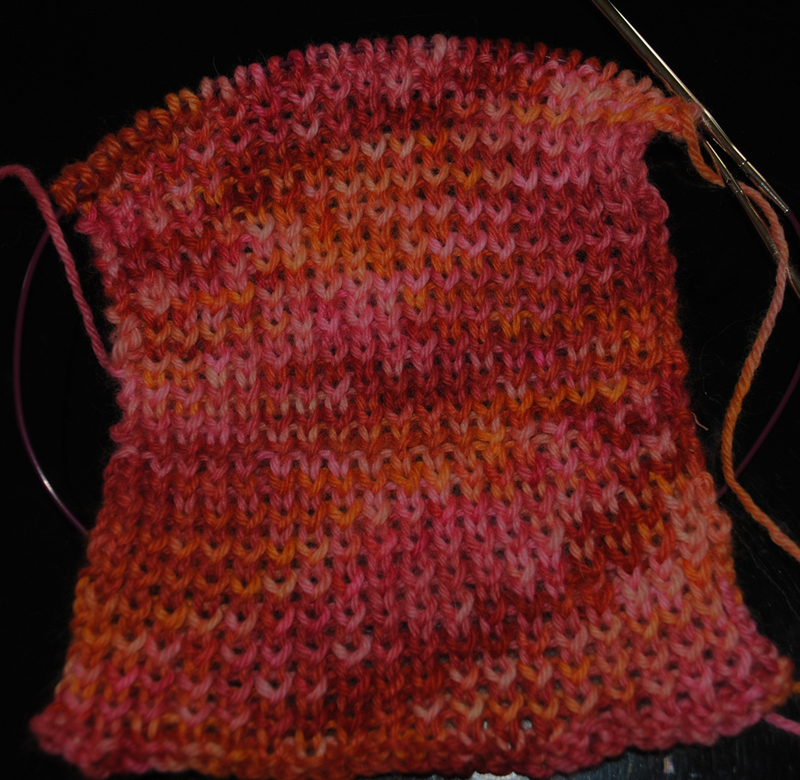 In stockinette, it will show off any variability in your knitting. So if you are not a consistent knitter (I can be very inconsistent), you should consider paring this yarn up with textured stitches like moss or seed stitch. Because the fiber tends to be very heavy and dense, a pattern with cables is going to be too heavy and the garment may pull out of shape from the shear weight of itself. A lace pattern might be a better choice. Still because alpaca is not elastic and is not resilient, a garment made with 100% alpaca should have enough stitch structure to hold the fiber in shape. You are probably saying to yourself, I’ve seen lovely alpaca sweaters. Yes it can be done. You just might want to consider a yarn that is a blend of alpaca and loftier, more elastic wool. A blend like that will allow you to make your cables and reduce the density of the sweater in the end. And an alpaca wool blend yarn can help your lace stay in it’s original size and shape. Finally washing, when you wash an alpaca garment, take care not to pull it out of shape. Support the weight of the wet garment, so that it doesn’t stretch. And block carefully. The fiber itself won’t spring back like wool will. 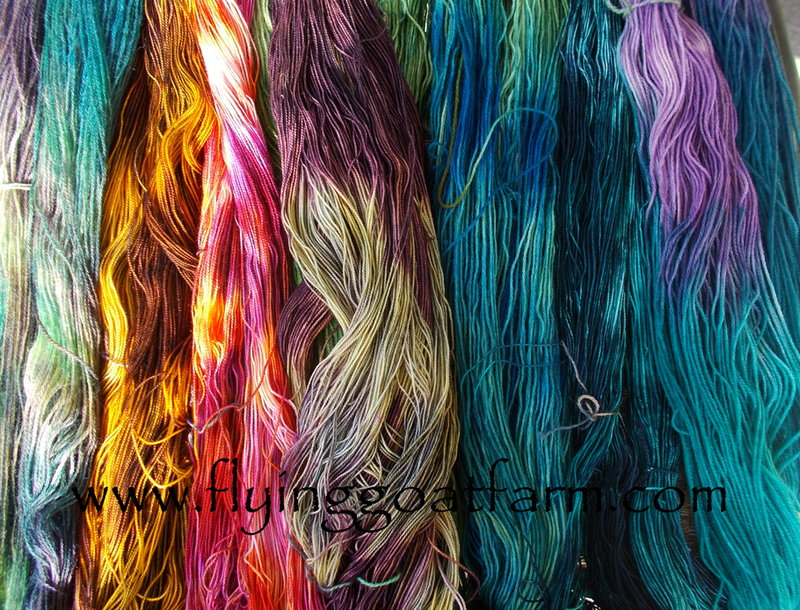 Flying Goat Farm has a 100% alpaca yarn called Nimbus. It is 2-ply, sport weight yarn. We sell skeins of 200 yards. It is made with superfine alpaca fiber grown and milled in Peru. This yarn is next to the skin soft. It has a slight halo to the yarn. It is perfect for a cowl, shawl or scarf yet strong enough for hand warmers, socks or a hat. It would look great as a luxurious shawl to wear to the symphony. It is light weight enough to provide just enough warmth on a chilly spring or summer evening outing. It is perfect for a complicated lace pattern, yet will look fabulous in a seed stitch cowl that you can wear on the ski slope. It is soft enough for a newborn baby sweater too.